It's said that silence is golden, but in the case of the Tesla Roadster, the world's first electric sports car, it is downright freaky. It looks like a car. It has a steering wheel and all the other things you get in a car. It starts like a car, too. But turn the key in the ignition and there's no mechanical noise, no rumble of cylinders, no minor explosions to let you know you've awakened a beast. Nothing except for a loud boing that signals the motor is ready for action, then a deathly calm. Pull away and the only noise you hear is a soft, electric whirr, like a milk van without the annoying whine. Driving the Tesla through the streets of London, it caught quite a few pedestrians unaware as they dozily walked into its path. Rest assured, though, that the brakes do work very well indeed. But better than the brakes is the way it accelerates. At the traffic light grand prix the Tesla is practically unbeatable; mash the throttle pedal to the floor and your face will feel like you've overdosed on botox injections. The force of instantaneous power pins you back into your seat, and the nose rises up as the Tesla squats onto its haunches and hurtles forward. Supercars? Pah, they're for meatheads. The Tesla is the thinking man's sports car. Power comes from batteries, 6,831 lithium-ions to be precise, which sit inches from your head in a large plastic container where the engine would normally be in this Lotus Elise-inspired design. They feed an electric motor, which in true sports car fashion controls the rear wheels. The advantage of an electric motor is that it can generate maximum thrust from zero revs. Putting your foot flat to the floor is like sticking two wet fingers into a plug socket. Electrifying. But rather than your hair standing on end, it will be your eyes as they try to adjust to the rate of forward motion. The immediacy of the acceleration never gets boring. Quite unlike most supercars which are merely getting into their stride at 80mph, the single-geared Tesla starts to wind down as it closes in on its 125mph maximum. Still, who needs to go any faster than this? 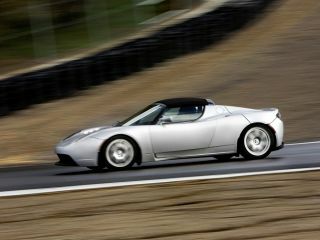 The Tesla is a responsible, environmentally hygienic supercar for the 21st century. The supercar even Guardian readers would approve of. Does it drive like a sports car, though? Show it a corner or two and it doesn't disgrace itself, its Lotus roots shining through and delivering rapid cross-country pace thanks to one of the best chassis in the business. Inside, it's standard Elise, so cramped but surprisingly comfortable. The touchscreen display below the steering wheel will appeal to gadget lovers, with a meter showing the range and energy consumption - a display you will want to keep an eye on since the Tesla manages no more than 200 miles on a full charge and less than 100 if you're in a hurry. A full charge takes 16 hours, by the way. So is this the future of the sports car? We really want to say yes, but with a limited range, lengthy charging time and the small matter of the £94,000 price, only the well-heeled few will be able to afford the silent pleasures of the Tesla Roadster.